The markets opened lower after the non-farm employment change was worse than expected. Shortly after the open they began to rally for the rest of the day and closed near the rally highs. The Dow closed at 10618, up 0,11%, the SPX at 1145 (+ 0,29%) and the Nasdaq closed the week at 2317 (+ 0,74%). 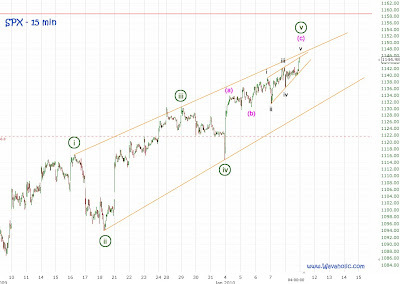 Since in an ending diagonal the subwaves subdivide into zigzags I was expecting a three wave move up today to finish the last subwave. After the morning rally we got some kind of a triangle and then the spike up to 1142.52 around 13:30. So it was possible that the three wave move was completed. The market however didn't drop below important trendlines and so we got another spike up late in the day to make another new rally high at 1145.39. With this spike we can clearly see now a nice [A]-[B]-[C] to the upside with [A]=[C]. 9 out of the last 10 Mondays were up days, and most of them opened with a gap up. So, the odds are clearly against a down day or even the beginning of a new downtrend.